Even though I am currently at an altitude training camp in Livigno, I am closely watching what's going on back home in Prague. And you know what? 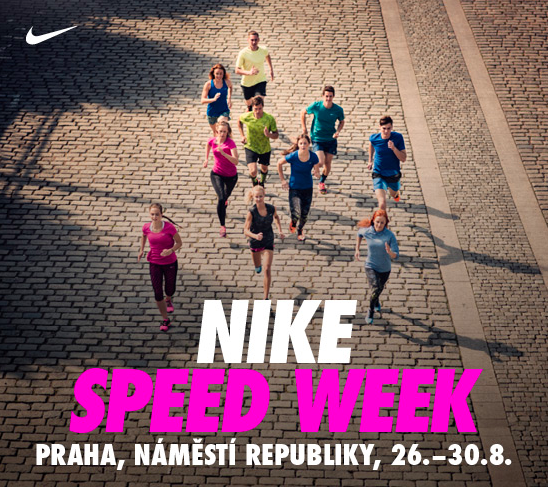 Nike Speed Week is going on! From today Wednesday August 26 up to Sunday Aug 30, you can find many events happening mainly at Náměstí Republiky. 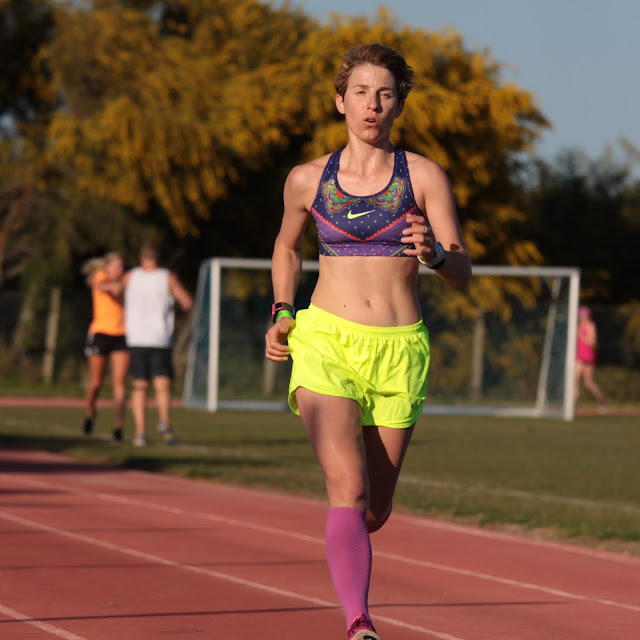 You can run timed mile (1 600 m) or sprint 50 m, you can join many of the Nike Running Club trainings - check out the full list of training events. Registeration link for the speed week is go.nike.com/zoomprg. More on training in Livigno coming soon! 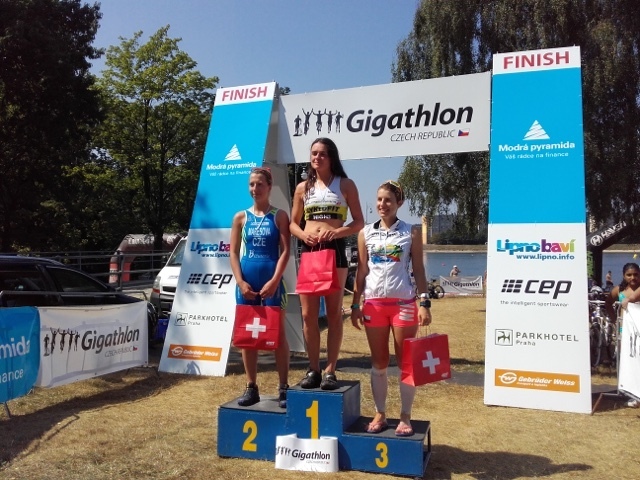 In July, I had the great opportunity to participate in Gigathlon race in Switzerland, as covered in previous Gigathlon posts. And as we prepare to the first ever Gigathlon outside of Switzerland at Lipno in September 2016, a mini Gigathlon tour takes place in different locations of the Czech Republic this year. That brought me to Jablonec. 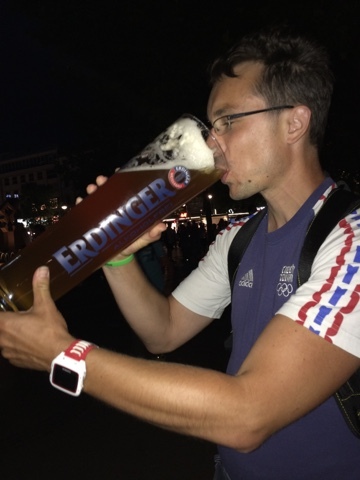 And as all my potential team mates were somewhere on vacation abroad, I decided to sign up for the whole thing given the fact the distances are sort of "sprint": 500 m swim - 2.3 km run - 5 km inline skating - 10 km mountain bike - 2.3 km run. We went for a test ride through the mountain bike loop - the race was two times 5 km loop. I was glad I did it even though I thought of switching to couples for a moment. I am just really afraid of downhills on the MTB, I am not used to it, we had made a switch for the two weekend with Kačka so she has the pleasure to ride my beautiful road bike :) Thank you for the bike! Inline skating was done on a part of training loop for cross country skiers so it was nothing flat, but not too dangerous, though some people were afraid of going fast on downhills. I really liked it. Happy finishing 3rd even tough the girls ahead were pretty far from my reach. Need to work on swimming! 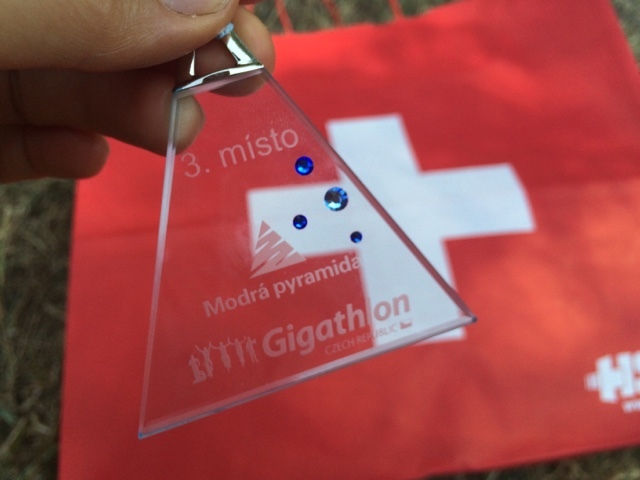 Interested in trying Gigathlon? You can do another mini race in Plzeň on August 29th - check out the official Gigathlon website for more information on Plzeň and on the big race next year at Lipno! Also follow Gigathlon Czech Republic on Facebook. 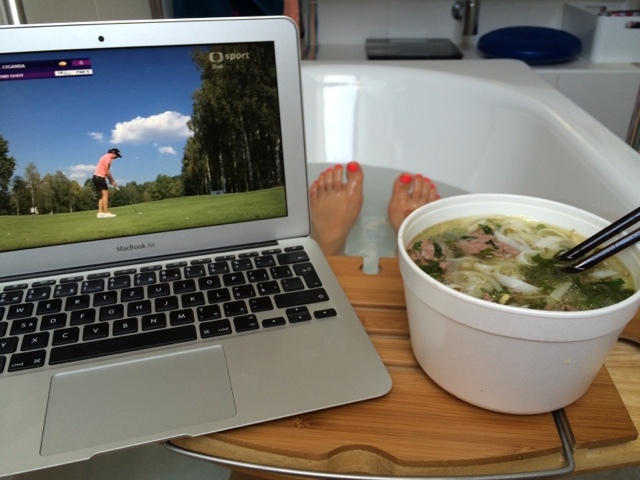 And perfect recovery treat back home - ice bath while watching Ladies European Tour and eating Vietnamese Pho beef broth ... great way to refill on minerals and carbs (rice noodles). Saturday July 25th was kind of exciting! 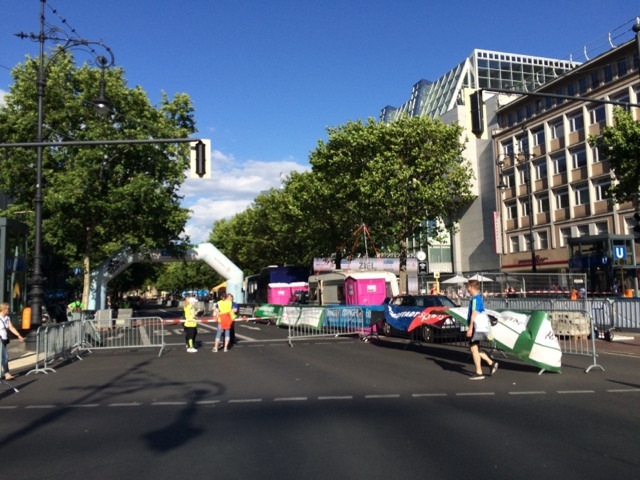 We (Evča & me) ran the City Night Run Berlin - the 10 km race in Berlin on pretty fast course. 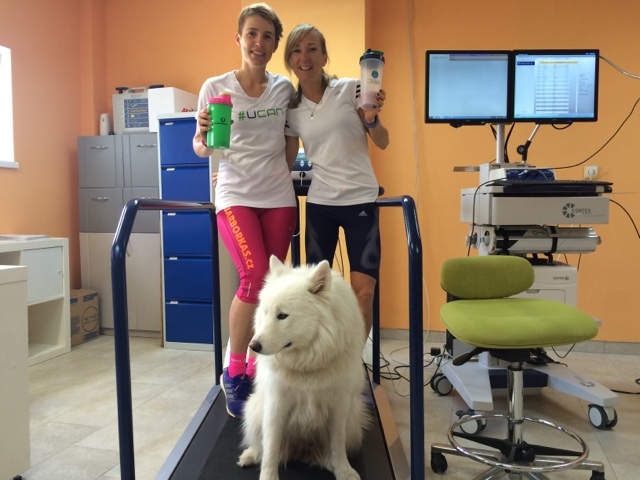 Exciting was the whole weekend as we are putting our partnership together BE On The Run ... meaning Barborka & Evča On The Run. You know, partnering up with an olympic athlete is "kind of" exciting!!! YAY! 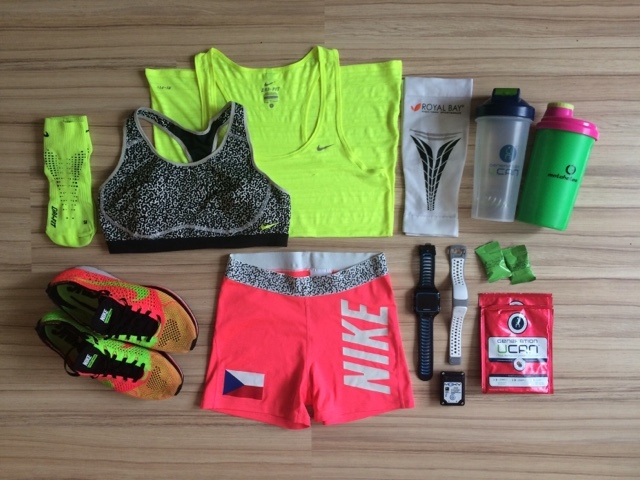 Saturday morning - ready to rock the race: racing gear - Nike, Garmin, Moxy monitor, Generation UCAN & Matcha Tea. 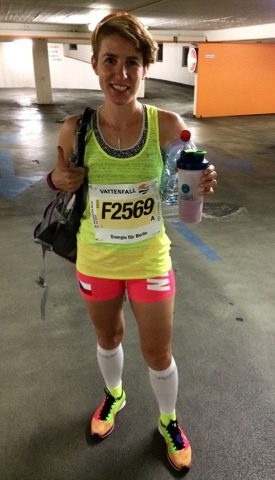 Managed to get elite entry for Evča due to her current best time of 33:40 for road 10 km. As it wasn't "A" race that I was tuning up for etc. I ran with Moxy monitor on my quad to monitor oxygen saturation and haemoglobin availability in my muscle. And you know what happened??? 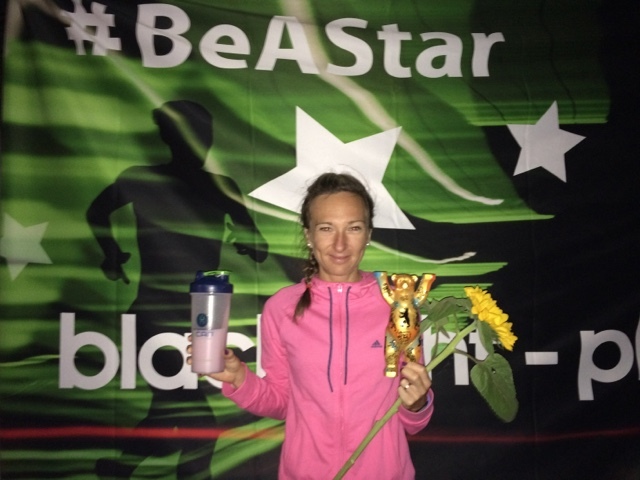 Evča won the race in her new personal best of 33:22! 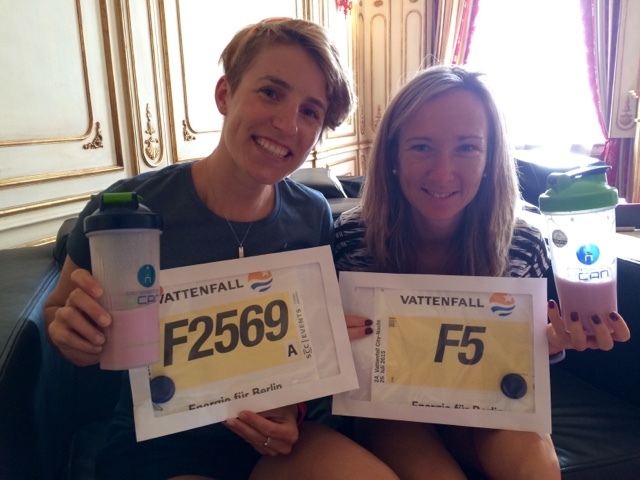 I was really excited seeing her leading the women's race little more than 1 km before finish <3 It is exciting to have team mate! 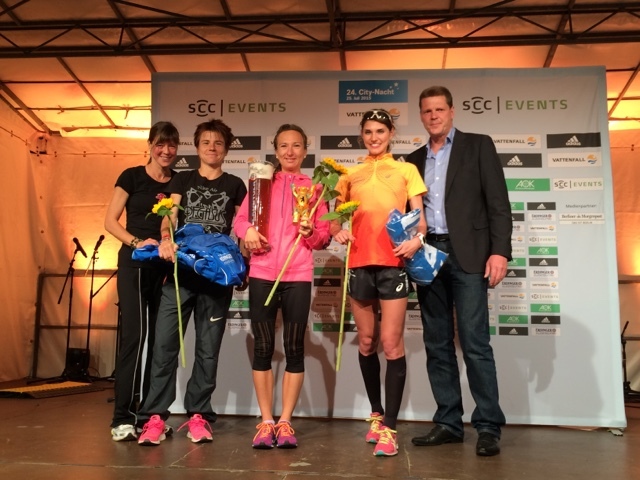 Prize giving ceremony - Evča outran the winner of Vienna marathon 2015 (with marathon time of 2:30:06). And how did my race go? As said, my biceps, triceps and abs were truly sore after the gym session we did :D No big expectations, also little heavier than I would want to be for an "A" 10 km or marathon race... about 60 s before the start someone grabbed me from behind. Guess what? Nick Anderson from Running with us, the coach who leads the coaching on training camps in Portugal I have attended in March 2014 & 2015. He didn't know how fast he would go - being definitely faster runner than me. We exchanged few sentences and here was the start! And there she was flying down the street! I screamed really loud and cheered for her. Immediately after doing so I knew Nick would not be happy with it. I think he shouted at me something like "If you can scream that loud, you can run as well." At least I would scream that at myself anyway :D So I tried to give it my best, but managed "only" to hang on. On the other hand the wind gusts were coming on us pretty hard on the cross streets. Finally there was the turnaround, then 8 km mark, the 9th km seemed never-ending, but as usual, the mind was playing tricks. Because I managed to run the last kilometre in 4:08, almost 20 seconds faster than the previous one :D On the other hand, I seriously did not have much more in me that day. Official chip time: 43:13, which is 12 seconds shy of my personal best. I will take it given the phase of my training and my current state. Hard work lies ahead! I need to learn to switch off the head and dig deep. 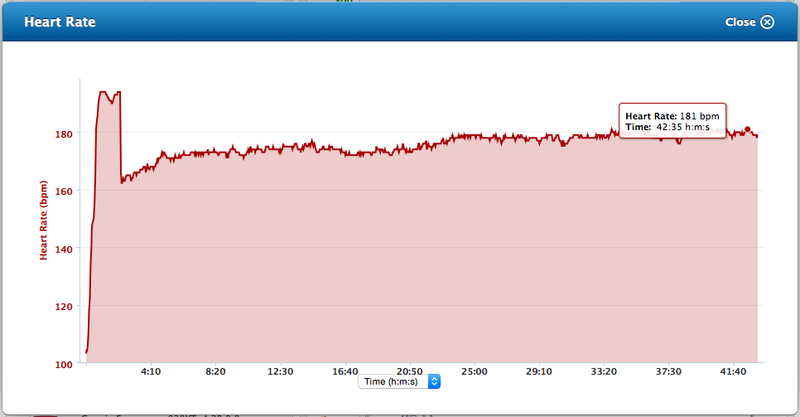 The spike at the beginning was not real, that was my Mio Link acting crazy - went totally OK as I tightened the bracelet. Moxy monitor record - it includes the pre race warm up and some time after the race. Shortly about Moxy Monitor - it is a small black box that you can attach to almost any muscle on your body. 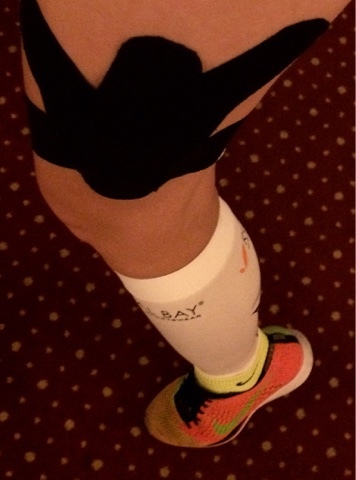 For running workouts I attach it on the side muscle on my quad as seen on the photo above. The two values it gives you: SmO2 meaning percentage of oxygen saturation in your muscle and THb = haemoglobin. So far I understand more the SmO2 reading and that is what I use in my training. 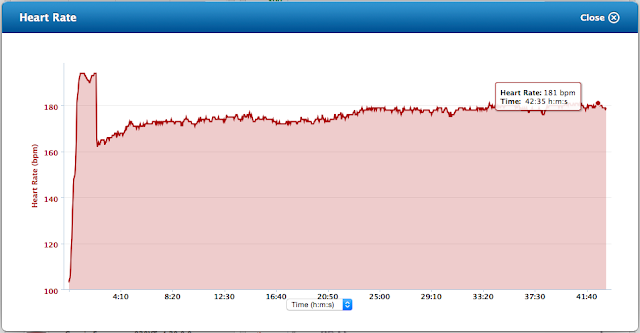 Here you can see how the oxygen starts being used up at the beginning of the race, then becomes somewhat stable when I slowed down a little after the 2nd km and finally you can see that I squeezed a lot of myself ending slightly above 25 %. 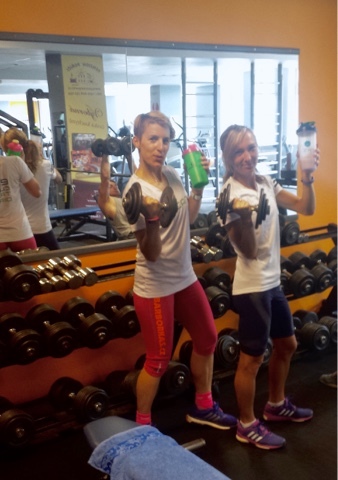 That is what I have been training now once a week - as I am not lifetime athlete and only started running few years ago, my muscles need to learn how to max out themselves :) But more about Moxy training in another post. On the technical part - I use Moxy with Garmin Forerunner 920xt, the transfer is done through ANT+ protocol which is same as for your heart rate monitor or cadence meter. It needs a watch with Garmin ConnectIQ so you can download the Moxy app, so far that means Forerunner 920xt, fénix 3 or vívoactive (interested in ordering any of these? just email me: barborka(at)ontherun.cz). I was amazed about the testing facilities they have available at the clinic next to the gym! 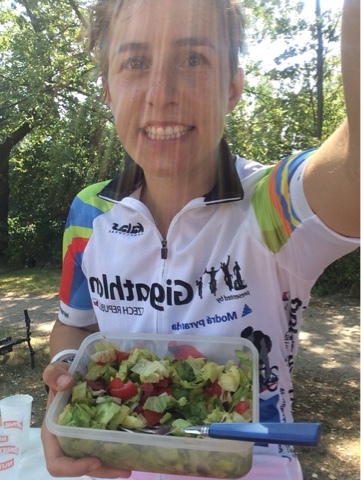 We were busy driving to an appointment after the gym session, so we had delicious lunch on the go. 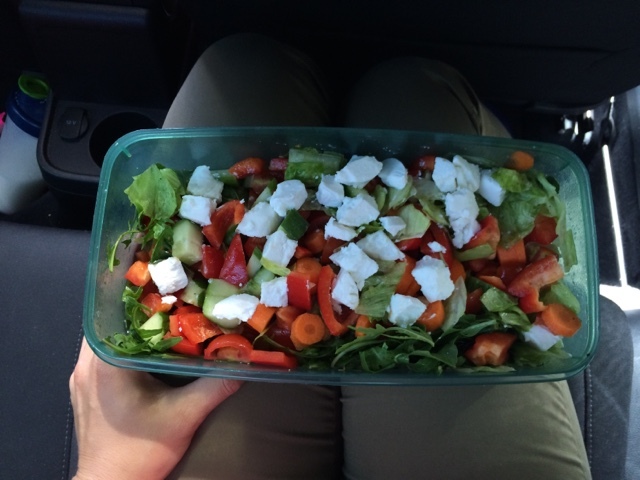 HUUUUUGE salad with goat cheese :) Yummy!